The RSV12B single vented speaker box is made in the USA with Grade "A" ¾" MDF wood. This enclosure is made with precision cutting machinery by industry experts that have been making these enclosures in the USA for over 20 years. All Rockville enclosures come with a customized enhanced glue that is unmatched by any other manufacturer. That means that the carpet will stay in place and not rip or tear. The ¾" USA MDF is much stronger then any type of import wood. This will keep your box performing at an optimal level by not flexing and distorting your woofers. Your woofers will thank you! EVERY Rockville enclosure is not only glued at all joints but stapled as well. If that wasn't enough we add a layer of silicon to every seam! This makes your Rockville enclosure rock even more! MADE IN THE USA WITH PRIDE! 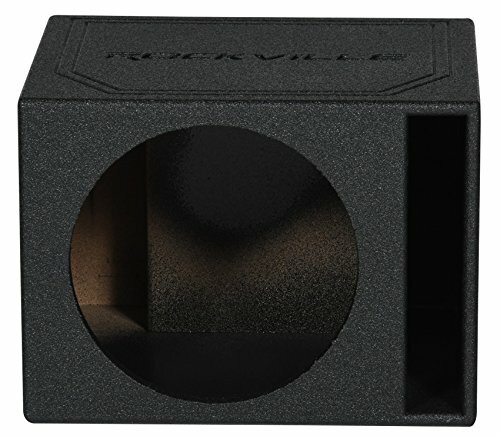 Rockville RSV12B Single 12" 1.22 cu.ft. Bedlined Vented Subwoofer Enclosure Box. Proudly Made In The USA, Using Only The Finest Quality Materials - For The Best Level of Performance From Your Subs!. 3/4" USA Heavy Duty MDF Construction. Machine precision cut mounting holes. Top of the line Glue for extra durable adhesion. High quality GOLD screw down terminals. Designed, tested, and engineered to work with most of today's popular woofers. These enclosures are built with the quality additives needed to maximize the performance of any sound system.. Covered and Finished with a Durable Bed Liner Coating. Enclosure Measurements: Type of Enclosure: Vented. Enclosure Sub Size: Single 12". Dimensions in Inches: 16.0" L x 18.0" W x 13.25 H". Top and Bottom Depth: 16.0". Mounting Depth: up to 14.75" (enough depth for any sub on the market). Tuning Frequency: 38Hz. Port Dimensions: 2" x 21" x 12". Gross Volume Per Sub (Measurement for the outer dimensions of the box): 1.50 Cubic Feet. Net Volume Per Sub (Measurement for the outer dimensions of the box less the thickness of the wood and port): 1.22 Cubic Feet.